Home HOLLYWOOD Spoiler Alert! Khal Drogo Returning In Game Of Thrones Season 7? Game Of Thrones season 7 is much anticipated by the masses. The last season ended on a tricky note and now the fight for the Iron Throne is fierce than ever. The last season of GoT saw Jon Snow as the Lord Of Winterfell and the dicey exchange of glance between Lady Sansa and LittleFinger. Apart from the stated, Emilia Clarke aka Daenerys is marching towards the throne. 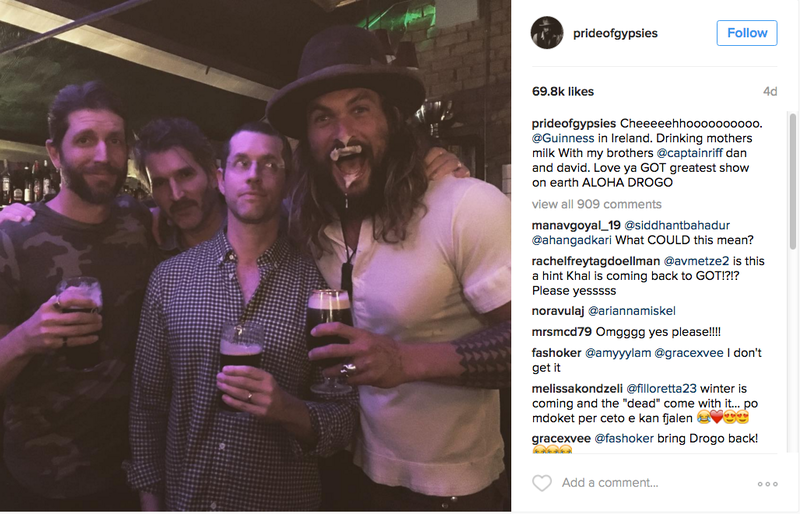 Well, fans are in for a surprise treat, now that speculations of Khal Drogo’s return are making rounds. Reports hint at the fact that Khal Drogo might return in the season 7. The character of Khal ended very early in GoT. Just when the audience started to adore Drogo’s on screen image he was out of the show leaving Khaleesi to fight for herself. Jason Momoa known for his huge physique might return in his muscle filled avatar in the season 7. The actor shocked all the fans when he posted a picture with makers of the series David Benioff and D.B.Weiss. Fans are already speculating various story angles which may justify Khal Drogo’s presence again! The upcoming seasons of GoT are delayed because the makers are waiting for the right weather to commence with the shoot. Previous articleTweet Review: Did Tiger Shroff-Jacqueline Fernandez’ A Flying Jatt Impress The Audience? Next articlePhotos: Sidharth Malhotra-Katrina Kaif Set The Stage On Fire!